​​Of all the weeds at Bangalee, Madeira Vine is by far the hardest to permanently remove. Fortunately though, we only know of two sites in the entire reserve that have Madeira Vine problems. Both are near the old Condie homestead. 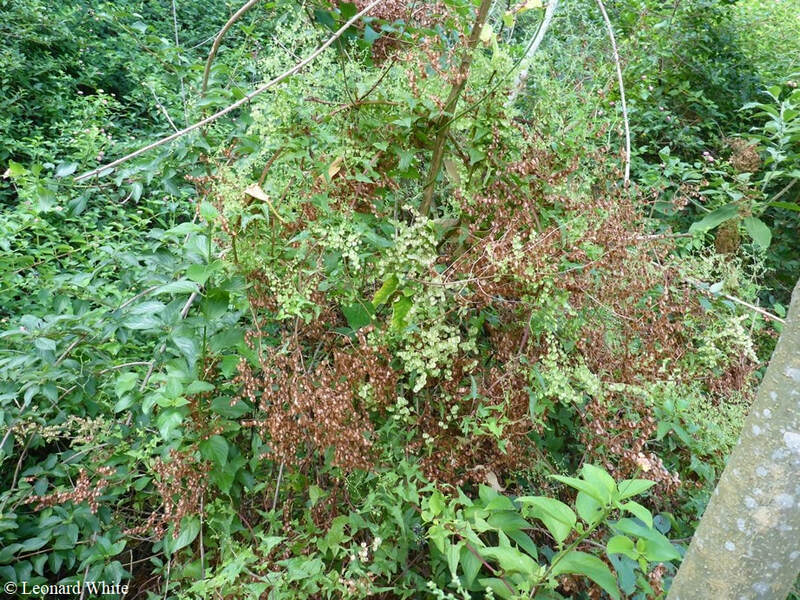 Madeira Vine poses a severe environmental risk because of the damage it can do to trees. Its distinguishing feature is the aerial tubers that grow every few centimetres along its stem. Similar in appearance to ginger roots, these tubers can get very large and very heavy. If the vine is left to grow, the weight of the tubers will break branches off the host tree or even cause it to fall over completely. Not only that, but every single tuber has the potential to grow into a new vine. The tubers of Madeira Vine are easy to recognise. However, the leaves can be a little more challenging to identify. Madeira leaves are quite round but do taper to a point at the end. They are light green in colour and have a texture and appearance reminiscent of a succulent. ​It is particularly important to be able to recognise the leaves because young plants do not start growing tubers until they are a few metres long. Ideally, the vine should be removed before it starts growing tubers. The best method of removal depends on the size of the vine and the extent of the infestation. For vines that are up trees, a tarp should be spread under the tree before any attempt is made to remove the vine. The tarp will hopefully catch most of the tubers as they fall. If the vine can be reached by hand, then it should be carefully pulled down. If not, pull it out by the roots and leave the tarp there until all the tubers have dropped. For vines that are on the ground, removal by hand is the most effective approach. An infested area should first be sprayed with Roundup. This kills off all other species so that Madeira regrowth can be easily spotted. Once the vine starts to reshoot, the stems should be followed to their base where the tuber is located. The tubers absolutely must be dug out or they will just regrow. To make the task even more challenging, Madeira vine has runners under the soil which also produce tubers. The runners must be carefully removed and all attempts made to find as many tubers as possible. Any tubers collected MUST be bagged and put in the rubbish. Madeira tubers remain viable for years and do not decompose easily. If they are pulled out and left, they will regrow. Most importantly, have patience and be diligent! An infested site should be checked fortnightly or more often if the conditions are favourable. Don’t expect to eradicate it quickly. The two sites at Bangalee have been worked on for nearly ten years and we are still finding regrowth! ​Turkey rhubarb is a dense vine that is extremely hard to permanently remove. Unlike many other vines, turkey rhubarb is not a very good climber. It will spread vigorously over the ground but rarely makes it more than a metre or two up a tree. Even so, left unchecked, it will completely smother any native plants on the ground and will break off the lower branches of more established trees. Its arrowhead shape leaves and deep red stems make it relatively easy identify. In spring and summer it gets masses of small, white flowers that look very much like miniature Begonia flowers. As the flowers ripen into seeds, they steadily turn deep pink or red. Turkey rhubarb is hard to permanently remove because of its many underground tubers. Similar in appearance to radishes except brown, turkey rhubarb tubers extend throughout the area covered by the vine. A single square metre of infestation may have dozens of individual tubers. The picture here is of an extremely large Turkey Rhubarb tuber. They normally don't get this big. Between 1 and 7cm long is much more normal. Pull out the vines and bag up any seeds. Attempt to dig out the tubers. If there are too many tubers, use Roundup whenever the tubers begin to reshoot. We have found that spraying regrowth every few weeks throughout the growing season can kill the vast majority of tubers in as little as one year. ​Moth vine is a true vine in that it wraps itself around trees and climbs. It is does not pose a particularly serious threat to the trees at Bangalee as it seems to rarely grow very large. However, left uncontrolled, it can eventually either strangle a tree or cover its canopy with so many of its own leaves that the tree will suffer from lack of light. Moth vine is identified principally by the milky, white sap that comes out of its leaves and stems when broken. It leaves are light green and slightly triangular in shape. The leaves are in pairs and grow opposite each other on the stem. The stem itself is very light brown and slightly rough-barked. Moth vine flowers from late spring to late summer. It has small, white, four-petaled flowers. The flowers mature into large green pods that closely resemble chokos. They open in late autumn releasing thousands of furry seeds that are easily carried by the wind. Pull out the vine at the roots and leave it in tree if is too big to pull down. Bag all seed pods! If there are too many moth vine seedlings in a single area to remove by hand, spot spray with Roundup. ​Cape Ivy mostly inhabits the area immediately near the edge of the Shoalhaven River as well as along gullies and creek beds. It is largely an annual vine, growing vigorously in spring and summer before dying back in winter. Its bright, green leaves look quite round except for the five to seven points that line the edges. The leaves grow off the stems individually rather than in pairs like many other vines. The vines themselves are a similar colour to the leaves and have distinct nodal sections. Both the leaves and stems lack rigidity and are very easy to break. Cape Ivy flowers in late winter with clusters of small, yellow flowers appearing all over the vine. The flowers do not have obvious petals but look more like miniature versions of the pollen centre of a daisy. As with scotch thistles, Cape Ivy seeds are fluffy which allows them to be transported by the wind. While the vine often seems to die back after flowering, it is not completely dead and will regrow once the weather warms up. Hand removal is usually the easiest. The vines break easily and do not seem to regrow once they have been pulled out. Roundup may be needed in areas with heavy infestation. ​​There are two kinds of feral passionfruit at Bangalee, caerulea and subpeltata. Caerulea is a vigorous grower with an impressive root system. It is typically used as root stock for other domestic species of passionfruit. As a young plant, caerulea has bright-green, ovulate shaped leaves with a slightly wrinkled appearance. In more mature vines, the leaves become three-lobed with each lobe radiating out from the node. They also turn a much darker green and grow to around 10cm long. Subpeltata is a much less aggressive vine but can still cover quite a large area. It has smaller, light green leaves that are quite flat and look slightly powdery. Subpeltata leaves are also three-lobed and the split between each lobe extends halfway to the base of the leaf. The flowers of both species are, large, colourful and frilly. They have numerous, long outer petals which open up flat to expose the more delicate inner petals and large stamen. The only real difference between the two is that caerulea flowers are largely blue whereas subpeltata flowers are completely white. The fruits of caerulea are large, and ripen to a bright orange colour. On the other hand, the fruits of subpeltata are smaller, grey-green and have a powdery texture. As far as we know, the fruits of both species are poisonous. Manual removal is easiest. Cut the stem off and leave the vine where it is. Dig out the root ball with a mattock if it can’t be pulled by hand. Trad is a fast growing, segmented ground-covering vine. It has fairly broad, 2-3cm long lanceolate leaves aligned alternately on a thin, green stem. Combined, the leaves and stem look vaguely like a succulent. Another distinguishing feature is the funnel shaped new leaves at the end of each stem. Left uncontrolled, Trad will completely cover the ground with a thick, green mat of vines that will prevent anything else coming through. Trad flowers are about 0.5-1cm across and have three triangular petals. Both the petals and the centre of the flower are white although yellow pollen heads can be seen on short spires in the middle of the flower. Hand pull small patches or use a hoe. The segmentation means that roots set at every node which makes manual removal only possible for the smallest infestations. For large quantities of Trad, spray with Roundup. It is very tough and will take weeks to die fully. Fortunately, Bangalee does not have significant issues with blackberry. Most of the blackberry is restricted to small patches growing along the riverbank, probably brought there by floodwaters. Blackberry is easily recognised by the rose-like thorns all over its brown stems. The leaves are typically three-lobed and have small serrations along the edges. The flowers are also easy to recognise by their pinkish-white colour and five petals. The fruits, well, they hardly need to be described! Cut stems to reveal stump and dig out stump with a mattock. If the vine is too big to safely remove by hand, spray with Roundup.